One chef. One travel editor. One too many detours. One of the good thing about travelling in Central Europe is their coffee loving culture. It has been a big part of their lives and not just a fad of extravagant coffee drinks. But it is about drinking good honest coffee and enjoying some good company. This is also a thing in Prague, where coffee houses are in abundance. So, me and my LeSac fellow (Primarita) has made a list of those cafes before going there. And for us, there is no better time to drink cup then every moment possible. 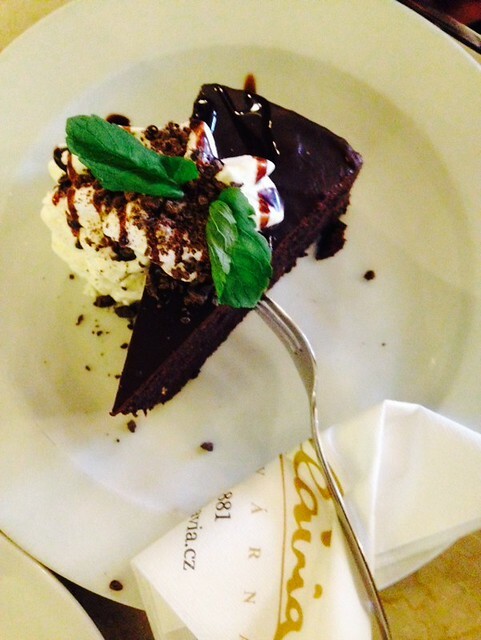 The place that was on top of our list was Kavarna (cafe) Slavia. And, after visiting the Prague Castle and walking all day in Prague, this is the place to stop and rest our feet. The cafe is located opposite the National Theater. History said that this coffee house was build just a few years after the National Theater opened for public. It is meant for theater goers who wants to relax before and after watching a show. Unlike your normal coffee house, Slavia is build with art deco at heart. The look does not changes over the years and by the way, it opened in 1884. When we planned to go there, we heard not only good stories but also a few downers. Many told us or we’ve read about how great the place is. How the food is still authentic and the menu doesn’t really changes. But that we need to brace ourselves for the very long queue. Until now, this place is still a favorite for locals and tourists. 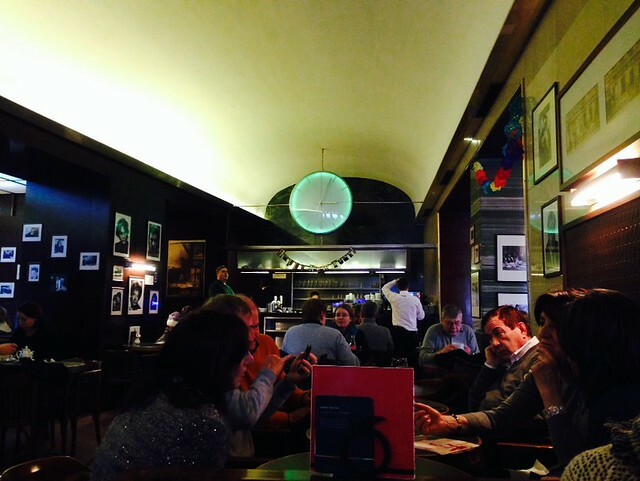 Who does not want to sit in a cafe that is the hang out joint for the likes of Kafka and Vaclav Havel?. Well, what people said is true. When we entered thru its giant art deco glass door, the queue was long. Fortunately for us, Lady Luck was on our side. We were just putting our coats down in the deposit and voila a table is just cleared and would fit us. We got a table in the non smoking section, some sort of a box seating area with old school sofa and marble topped table. It is actually quite spacious for us. Once we sat down, the server gave us the menu and not long before we finally decide what to order. We chose Apple Strudel and Sacher Torte to accompany our coffee. The pastries was great as expected. 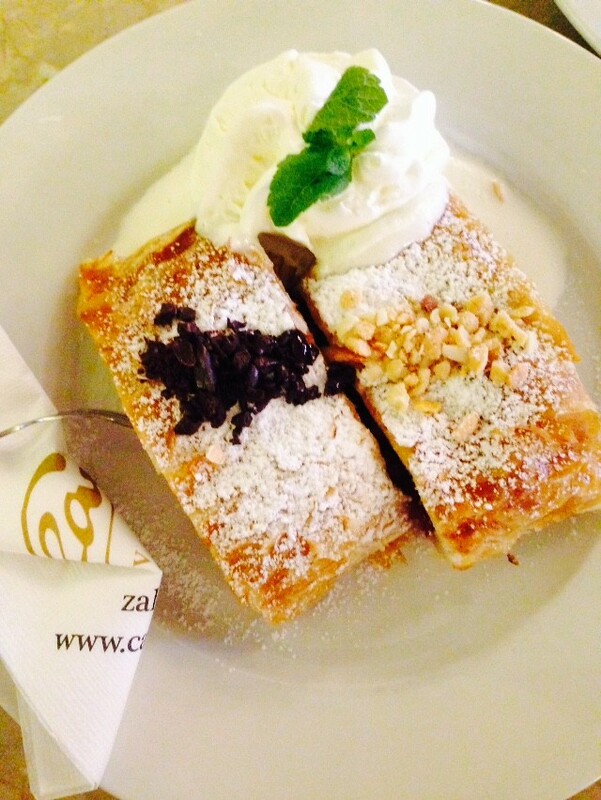 The warm apple strudel is served with ice cream. The filling was so full, it spilled all over my plate. The apple still has a bit of a crunch and mixed with raisins. A hint of cinnamon present in the after taste. And of course, it is covered with a thin layer of dough. As for the torte, it is up to par to what I have learnt to make in school. The chocolate was intense and balance by the presence of jam in the cake. No wonder that the cafe is still going strong until now. If you want to have a taste of nostalgic Prague, this is the place to go.